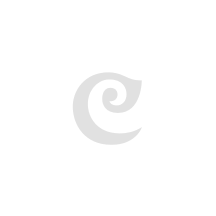 Bangles: Buy From The Largest Collection At Craftsvilla! Bangles are one of the most important parts of an Indian womens clothing. For ages, it has been considered the best of traditional accessories that can change the look of any outfit. However, there is the much deeper importance of bangles. They are considered an auspicious ornament for a married woman in India. No matter what the religion is, bangles hold great importance for women. A bangle is a round bracelet for women that is often worn in one or both hands. There are different kinds of materials used in making bangles and at Craftsvilla, we have it all! Ladies need a bangle that can complement their dresses and can also be comfortable in their hands. Hence, at Craftsvilla, we design all the bangles for ladies and even men, keeping in mind their needs and wants. Bangles have been worn by people all over the world for centuries. These are one of the oldest kind of ornaments that human started wearing. The bangle and bracelet have been discovered from a lot of archeological sites all over India. People are living in civilizations as old as the Mohenjo-Daro have also been proven to wear bangles. Contrary to popular belief, men's bracelets and karas were as common as the women’s in the ancient civilizations. The bangles and bracelets were made of different materials such as copper, bronze, sea shells, gold and much more. Over the years, the trend of bangle and bracelet has stayed but has taken different shapes. Gold bangles paired with a gold necklace are some of the most common types of bangles worn by Indian women. With time, there has been many changes in the pattern and the design of the classic bangle or bracelet that was found in the ancient times. At Craftsvilla, we make sure to incorporate the ancient bangle designs in our collection and add a modern touch on to it to provide a much better look. So, we are assured that this amazing ornament from our collection will only add to the look of your dress and make it stand out. Material- The first thing you should decide is the material of the bangle you need. The glass bangles are the most common kind of bangles available for the women. 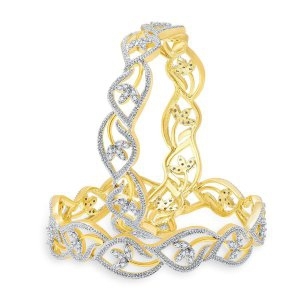 However, you can also go for gold or gold plated bangles. If you are not a fan of the gold metal, then buying the gold pleated bangles can also be a good idea. The metal bangles and bracelets are more durable than the glass ones. Color- The next thing you need to decide is the color of the bangle or the color if the work you would like the bangle to have. So, decide whether you want a glass bangle that comes in a variety of colors or just a gold bangle with different designs and stones. Size- The next thing to consider while buying bangles online is the correct size of your wrist. Some people like wearing bangles that are a little loose and some like to wear them tight. So, know what size is preferred by you and select the appropriate size to avoid any confusions.Also, do not forget to look at the width of the bangle before ordering it. Style- There are a variety of styles in which these bangles are available. You can get the plain glass or gold bangles. You can get the bangles that have stones studded on them. 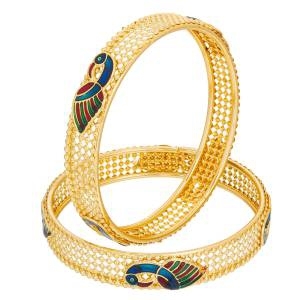 There are also bangles that have meenakari or other kinds of work on them. Our collection of the bangles and bracelets online is one of its kind. We have incorporated designs that will suit the women of all ages. 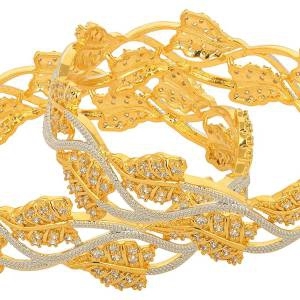 We have specially designed gold bracelets for men and women. We pay great attention to designing men’s gold bracelets so that they are given a wide variety to choose from. 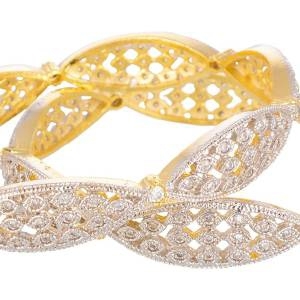 As for the women, our bangles, online collection consists of studded bangles, gold bangles, glass bangles and much more. There is a huge variety of color to pick from. We also have specially designed bracelets for young girls that will ensure that their outfits look much classier and pretty. So, buy all types of bangles online India at Craftsvilla and never go out of fashion. The shopping experience is one of the biggest things that online shoppers look before buying a product at any website. Hence, we make sure that our customers get the best shopping experience when they decide to buy bangles online. Our website has been designed in a way that it can be run smoothly by anyone operating it. We completely understand that bangle online shopping can be a really difficult task. Hence, we provide accurate measurements and replacement policies that no user can ignore. Additionally, shopping bracelets online have never been easier and safer. The customer satisfaction and their safety is our prime motive, and we make sure that their information is always kept private. So, shop for your bangles and bracelets from the vast collection at Craftsvilla and have the most amazing shopping experience of your lifetime.